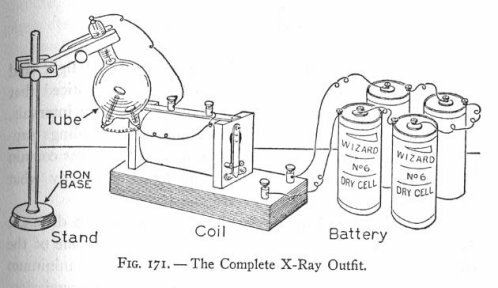 It took a few minutes of flipping through some books in my workshop, but I eventually found what I remembered: That one of my “boys” books contained a description of a tabletop X-ray setup. The book in question is The Boy Electrician, the first volume of many from Alfred Morgan, who later wrote The Boys&apos; First Book of Radio and Electronics and its three sequels, all of which loomed large in my tinkersome youth. The Boy Electrician was originally published in 1913 and is now in the public domain. The 1913 edition has been reprinted by Lindsay Books and I consider it worth having. There was a significant revision in 1943 that added chapters on radio and a few other things, and as best I can tell, the copyright on that edition was not renewed and it too is now in the public domain. A 40 MB PDF of the 1943 edition is here. 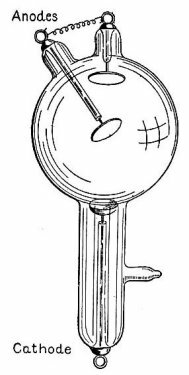 Morgan explains that you can either view images directly with a fluoroscope or expose ordinary photographic plates by placing an object to be X-rayed between the tube and the plate and leaving it there for fifteen minutes. This includes things like purses, mice, or…your hand. If you have the money, he also explains that a hand-held fluoroscope may be constructed by simply coating a sheet of white paper with crystals of platinum barium cyanide. 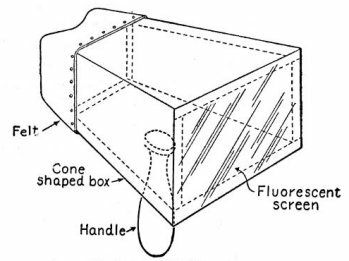 It looks like the fluoroscope screen is used by basically staring at the X-ray tube with the object to be X-rayed between the tube and the paper screen. We knew less about a lot of things in 1913; X-rays were in some respects the least of it. But the hazard is significant, if not as bloodcurdling as luddites specializing in radiation insist. People used to self-treat insomnia by inhaling chloroform; well-known Victorian British scientist Edmund Gurney died by falling asleep with a chloroform-soaked cloth next to his nose. We know more now, and understand the precautions a great deal better, which has led to an escalation of conern that (untempered by any grasp of statistics or risk evaluation) quickly descends to rank superstition. One has to wonder how much knowledge isn&apos;t obtained these days simply because people are afraid of small but nonzero hazards. Panic over traces of phthalates—then heedlessly drive fifty miles to a football game with a car full of kids. It&apos;s the modern way of life. Carol and I stopped at Square Deal Shoes in downtown Des Plaines last Saturday. We both bought shoes to leave at our condo so we don&apos;t have to pack them on future trips. While browsing the stock I also looked at their Simplex X-Ray Shoe Fitter. The machine was disabled (they&apos;ve been illegal since 1970) but it was otherwise in very good shape, housed in a marvelous Raymond Loewy-ish Art Deco wood cabinet. An excellent short history of this peculiar phenomenon is here. 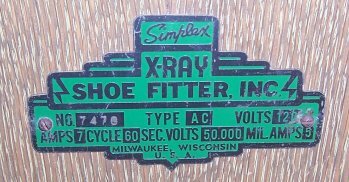 The machine shown in the article is, I believe, a more deluxe version of the one I saw at Square Deal Shoes; both were made by X-Ray Shoe Fitter, Inc., of Milwaukee. The name plate (below) indicates that the power supply drew 7 amps and put out 50,000 volts at 5 milliamps. That kind of power will generate considerable radiation out of an X-ray tube, and the associated hazards eventually put an end to continuous-beam fluoroscopy by untrained operators, in shoe stores and elsewhere. 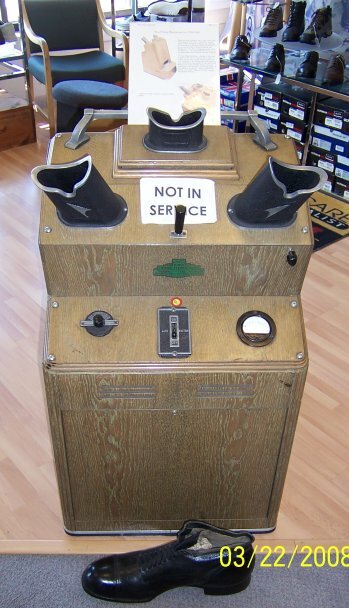 The hazards appeared not so much to the occasional shoe store customer as to the sales reps who ran the machines and sometimes to professional shoe models who tested shoes for manufacturers using machines like this; one woman&apos;s foot was damaged so badly in testing shoes that it had to be amputated. Square Deal Shoes has been in business since the 1920s, and in earlier times they also made custom shoes. One the current owner showed me was the shoe of Robert Wadlow, who at 8 feet 11 inches was the world&apos;s tallest man in the 1930s, and possibly the tallest man in recorded history. The shoe was technically size 37, and although I placed the shoe in front of the X-Ray machine in the photo above, it just makes the machine look small; the damned thing was as long as my forearm. As I mentioned in my entry for March 25, 2008, the world is full of odd things like this. Get out, look around, pay attention, and you&apos;ll see them. The weather today in Chicago promised to be as good as it gets this trip, so I decided to do a little exploring. I wanted to get some exercise and a little sun on my face, and run down to a neighborhood I hadn&apos;t set foot in for almost thirty years: Sauganash, an upscale part of the Northwest Side where my father&apos;s parents lived in the 1950s and 1960s. I went past the old house (at the corner of Kedvale and Glenlake), which had not changed at all, though the tree that my grandfather had planted in 1955 was now huge and breaking up the sidewalk. I had lunch at a hot dog place at Devon and Pulaski and parked the car on Pulaski near St. Odisho&apos;s Assyrian Catholic Church. I then did something interesting: I walked the old rail line that intersects Pulaski near Granville, southward as far as the Chicago River, roughly at Balmoral. The rails are still there, but by the depth of their rust I&apos;d guess they hadn&apos;t seen wheels for a number of years. It was a little weird walking over Peterson on the rail bridge, but I wanted to see if there was any evidence of there having been a commuter rail platform at Peterson. I&apos;m not sure why, but I always thought my grandfather boarded a train for downtown (he worked at First National Bank) on Peterson somewhere. This was clearly not the place. (Gretchen says he boarded at Edgebrook, and she&apos;s probably right.) Whatever that line was, it had clearly been freight-only. Since I was on the right of way, I just kept going. The tracks continued, rusty and weed-choked, as far as I went. Just a block south of Bryn Mawr, a second line merged with it, and I found that the city was in the process of making a walking trail out of the old bed. So I cut north again on the walking trail, passing people and their dogs and a father flying a kite with his preschool son in a schoolyard. 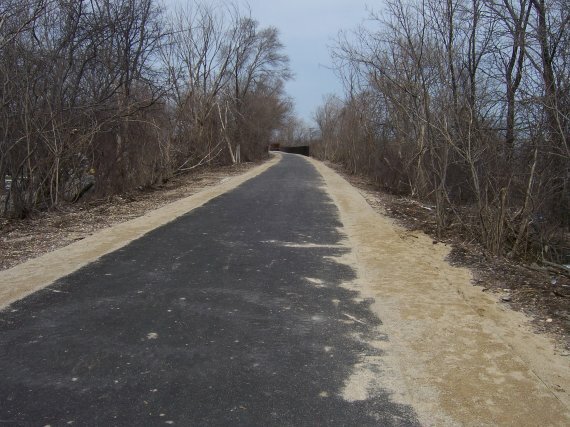 The trail is quite new, and in fact the walking bridge over Peterson was not complete yet and was fenced off. (The trail goes north as far as Devon.) So I skidded down the embankment and walked east back to Pulaski along Peterson to my car. It was a nice two-and-a-half mile stride, and when the sun was out it was quite warm. That accomplished, I drove back west toward Des Plaines, and stopped in Park Ridge to do a little more walking. I wanted to visit Hill&apos;s Hobby Shop, and walked there only to find that they have moved to Buffalo Grove. 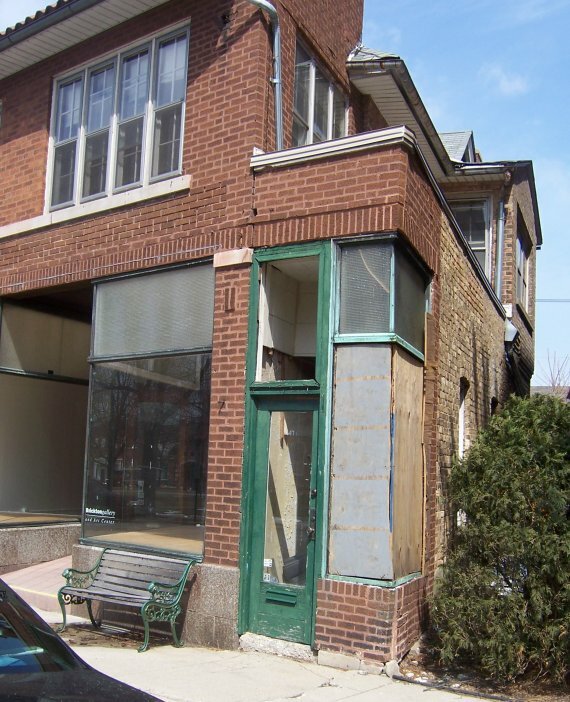 I did, however, snap a shot or two of what is certainly the narrowest storefront in Park Ridge (and perhaps the whole Chicago metro area) at 147 1/2 Vine Avenue (60068) directly across the street from Park Ridge City Hall. I didn&apos;t have a tape measure in my pocket, but I&apos;m guessing the whole thing was between four and five feet wide. I&apos;d seen it before, and remembered that it had been a knicknack shop a few years ago. Sure enough, googling the address showed it to have been (aptly) The Miniature Gallery, and there was a 2007 business registration sticker on the window. However, the counter and window displays had been ripped out, and it looks like it&apos;s being converted to something else, probably a hall to the rear. The art gallery in the rest of the building was also vacant, and the building as a whole was not in terrific shape. No serious point to be made here, other than you miss some odd and occasionally wonderful things by driving everywhere. Spring&apos;s coming—so get out on shank&apos;s mare and see some of the weird stuff in your own neighborhood! I&apos;ve had a difficult week here; new dental problems have arisen, culminating in an unplanned root canal this past Thursday, followed almost immediately by a much-delayed flight from Denver to Chicago for an Easter visit, where they happened to be having a blizzard. (The earliest Easter since 1913 corresponded with a lingering winter across the Midwest.) Tooth troubles continue, so if my posts have been (and continue to be) a little sparse, that&apos;s most of the reason. Our early Easter this year caused some people to ask how the date of Easter is calculated. Well, it&apos;s not pretty. At least next year it happens in April, whew. Here&apos;s a nice article describing a problem that is by no means recent: The split between people in the Catholic Church who can worship with a light heart, and people who invariably equate reverence with grimness . This has been an issue at least since Pope Pius IX lost the Papal States in the mid-1800s, after which the Papacy became obsessed with its authority and lost any ability to laugh at itself or anything else. (Pope John XXIII bucked the trend, but we didn&apos;t have him anywhere near long enough to make a permanent difference.) Roman Catholicism needs a sense of humor far more than it needs a Pope, but this may be one of those things that won&apos;t be solved within my own lifetime. In keeping with its long history of contempt for the consumer (which, in all fairness, is rife in Japan) Sony attempted to charge purchasers of its laptops $49 not to install a crippling load of crapware on the machines. Apparently they&apos;ve taken so much flak for it that they recently dropped the fee. What I find boggling is that they willingly cripple their own machines by selling huge numbers of crapware slots, which makes you wonder how much money they make in the crapware business. We may be heading down the same path here for laptops that printers have followed, in which the printer is a thin, shabby thing sold for very little that makes money for its parent company by consuming artificially expensive ink/toner cartridges. It seems that I&apos;ve been hearing a great deal within my own circle of contacts about people who try to help nontechnical folks (often parents) make Vista work with existing peripherals and software. The script goes like this: Nontechnical person brings home a new Vista PC or laptop from Best Buy and tries to install older software or connect it to various external hardware devices. Install fails; system aborts in various weird ways; technical person tries to fix (or simply understand) the failure, to no avail. Moral here: Do not use Vista. Everything that isn&apos;t needless window dressing is there for Microsoft&apos;s or Big Media&apos;s benefit, not yours. (Reread the venerable Vista Failure Log if you haven&apos;t read it for awhile.) You can still order PCs from vendors like Dell with XP preinstalled. Do it while you still can. And failing that, start researching Ubuntu/Kubuntu. Speaking of failure, WiMax (which we have seemingly been waiting for since the last ice sheets retreated) may be a failure because it&apos;s lousy technology. The wireless DOCSIS technology mentioned in the linked article as a solution has been around for some years and doesn&apos;t have a much better reputation. We may in fact be asking too much of low-power microwave broadband systems—fixed point-to-point broadband is totally at the mercy of topography and even vegetation—and I keep coming back to the conviction that some sort of “roof-hopper” mesh network may be the best path to follow. People are doing this in some areas; why it isn&apos;t seen as a more general solution puzzles me. Don&apos;t have much time today, but I did want to call your attention to an item aggregated on Slashdot: The Boston Dynamics “Big Dog” robot prototype, developed as a cargo mule for DARPA. Here&apos;s a must-see video of Big Dog in action, climbing up a wooded hillside, tramping through snow, and walking on ice. At one point a technician kicks the device hard on one side, and it recovers its balance beautifully without falling over, all the while carrying a load that weighs 30% more than itself. It uses a gait that looks more like a show dog&apos;s than a draft horse&apos;s, and while they do not demonstrate it in full gallop, they&apos;re clearly trying to teach it to run. Scary item, considering that this would have been impossible just a few years ago. I flashed on Cordwainer Smith&apos;s Manshonyoggers (from the German Menschenjaeger, man-hunter) which are human-scale Berserkers that run around a ruined world and kill any human being they see. Though hardly stealth creatures now, that&apos;s mostly engine noise and is a minor engineering problem. It&apos;ll be interesting to see what we do with them in a few years—or what the Bad Guys do with them in another fifteen or twenty. I had breakfast with Isaac Asimov. I shook hands with Robert Heinlein. Kate Wilhelm did a tarot reading for me. 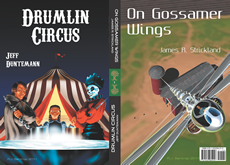 I&apos;ve workshopped with Gene Wolfe, George R. R. Martin, and A. J. Budrys. Nancy Kress is still a close friend. David Gerrold wrote for my magazine for ten years. I saw Keith Laumer from a distance once, and have had several conversations with Larry Niven and David Brin. But I have never been anywhere close to Arthur C. Clarke. Now I won&apos;t get the chance; as I learned on arriving at home this evening, he has died in Sri Lanka at age 90. Arthur C. Clarke was my favorite SF writer for a long time. Asimov was a little dull, and Heinlein&apos;s stridency bothered me at times, but Clarke was as close to perfect as SF writers got for me, at least in high school—and maybe still. His SF was about ideas, and he let nothing else get in the way of those ideas. I began writing SF by imitating his short stories. When I later began writing SF novels I was imitating Keith Laumer, because I knew damned well that I could never imitate Against the Fall of Night or Childhood&apos;s End. There&apos;s not much more to say. When a man gets to be 90 before he dies, I don&apos;t mourn, I celebrate. We had him a long time, and now he is free of all the suffering and limitations inherent in flesh. I happen to think that I may meet him yet…but let that pass. We have his stories. He worked his magic on me, and I would not be the writer I am if he were not the writer he is. Just one more word: Thanks, Sir Arthur. Really. And thanks again. Basically, charge more for it. That&apos;s all it takes, and I roared when I read the account on the Boston Globe site. Take that, ye wannabe wine snobs! In summary, when people have not learned the subtleties of wine flavors, they fall back on the assumption that good wine is more expensive than so-so wine, so when told how much a bottle of wine costs without being told what it is, they overwhelmingly declare that the more expensive wine is the better wine—even when all the wines in the tasting are exactly the same wine. After the researchers finished their brain imaging, they asked the subjects to taste the five different wines again, only this time the scientists didn&apos;t provide any price information. Although the subjects had just listed the $90 wine as the most pleasant, they now completely reversed their preferences. When the tasting was truly blind, when the subjects were no longer biased by their expectations, the cheapest wine got the highest ratings. It wasn&apos;t fancy, but it tasted the best. The larger issue, that expectations color what we consider “objective” perception, is worth close study, as it applies to a lot more than just wine. People say that house brands are inferior to name brand only when they&apos;re told which is which. Our sense of taste is not as good as we think, nor are our skills of perception. I don&apos;t buy brand name Rice Chex anymore, nor real Diet Mountain Dew. (And we buy Joe&apos;s Os when we&apos;re somewhere that they&apos;re sold; they beat Cheerios all hollow.) I save money, and I&apos;m just as happy as I was going with name brands. Objective quality is perceptible (and thus definable) for some things, less so for other things, and not at all for a great many (perhaps most) things. Being able to tell which is which is an important skill. Don&apos;t assume that you know more than you do, nor that you can discern more than you can. A recent phone conversation with Michael Abrash triggered some insights in this area. More on it when I find the time. And thanks to several people who sent me the Boston Globe link; I believe Rich Rostrom was the first. Was cleaning out my digital camera and came upon a shot I had forgotten. Some time back we were in a hotel room with $9.95/day wired broadband (via DSL) and I happened to look under the desk in the room. Boy, there was a mess down there like I haven&apos;t seen in a while. 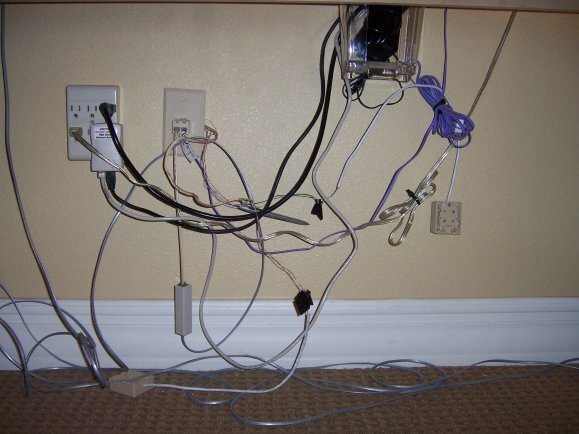 I never quite figured out what all that wirework was for, precisely, but it included two hasty splices partially wrapped in plastic electrician&apos;s tape, plus a hotel pen that had fallen off the rear edge of the desk and become lodged in the wad. (Dead center.) Wires had been pulled out from behind the telephone jack plate and spliced into a 4-pin phone jack that was literally dangling over a hanked-up data cable. Remarkably, broadband worked just fine—and that&apos;s the reason I didn&apos;t try to rescue the pen. An article from yesterday&apos;s Wall Street Journal basically confirms Borders&apos; ceding some territory in their war with online booksellers both used and new. (And “gently used,” i.e., read once and resold online.) Borders has begun a new shelving strategy in which a great many more books are shelved face-out rather than spine-out. To make room for all those additional face-outs, the chain will be reducing the numbers of titles carried per store by 5%-10%. For the larger stores, that will mean 4,000-9,000 fewer titles carried. For impulse buying, covers can matter. A big bold title and interesting graphic make it more likely that an aisle-stroller will stop and pick the book up, which is the big win in any kind of merchandising. It may take publishers a little while to realize that their covers may actually catch the eye of impulse buyers now. We might hope for better covers, or—gasp!—better back-cover or dust-jacket summaries. I expect there to be a lot of bitching and moaning about this, but it&apos;s actually a wise decision on Borders&apos; part. They&apos;re emphasizing one of the few facets of bookselling where they have an edge over online merchants, and thus helping guarantee that they remain in business. And from an author&apos;s standpoint, they&apos;re leveling the customer attention field a little: If you can get into Borders at all, you have a decent chance now of being face-out. One of the guerilla tactics of small publishers used to be sending junior staffers (often attractive young women) to stores to pretend to be browsers, picking up a spine-out title published by their employers, flipping through it for a second or two, then slapping it back on the shelf atop a face-out title fielded by a competitor. I don&apos;t know how well this worked. I do know that certain enthusiastic young swirlies (as Coriolis staff started to call themselves at some point) spent an insane amount of time at this. Now there&apos;ll be less cause to do it, and I&apos;m good with that. If I want to buy The Catholic Experience of Small Christian Communities, I&apos;ll order it online. If I just want to surprise myself, well, hey—I&apos;ll go to Borders.